Mothers of Beslan or Beslan Mothers’ Committee is a support and advocacy of nearly 200 parents whose children were among the more than 365 victims of the 2004 Beslan, Russian school hostage crisis where armed Chechnyans killed 344 hostages after holding them for three days. It was created in 2005 as a response to what was seen as the incompetence and excessive force used by the security services during the rescue attempt. They are also investigating negligence and corruption of the North Ossetian leadership, notably the former president Alexader Dzasokov, whose resignation was demanded by the group. The group is highly critical of Russian President Vladimir for allegedly covering up the circumstances of the siege. According to the Mothers of Beslan the terrorists made use of weapons and supplies that had been pre-positioned in the school, suggesting it was an inside job by school employees or town officials. This version of the events strongly contradicts the official narrative. Thirty members of the organization formed a second group, the Voice of Beslan. 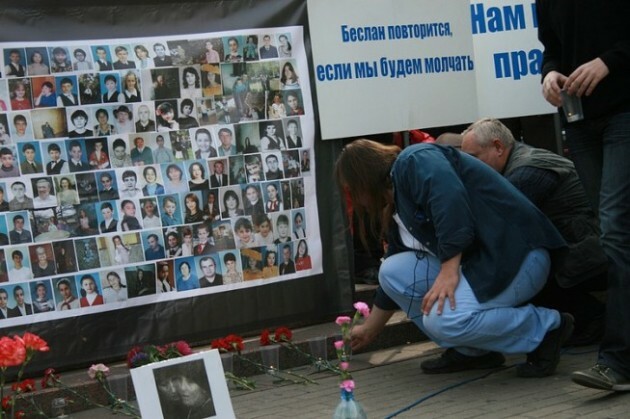 A member of the Mothers of Beslan, Olga Takaeva was present during the 2004 hostage crisis and joined psychologists in supporting the hostages, providing them with food, water and prayer. As one of the coordinators of the social movement, For the Health of the Nation, Olga is engaged in charitable efforts aimed at assisting the invalids, orphans, and parents lost in the Beslan tragedy. She also assists graduates of Beslan schools gain admission to higher educational institutions in Russia. Olga was a delegate to September 11th Families for Peaceful Tomorrows’ International Conference in 2006.